It is filled with hot guys, (Statham, Vin Diesel, The Rock, Ludacris, Paul Walker, Tyrese, Russell). It has romance, high fashion, and tear jerking moments. Most importantly it has women in roles of strength, power and intelligence including: Michelle Rodriguez showing that women can drive just as well as men, Rhonda Rowsey showing off her amazing fighting skills with the added obstacle of being in heels and an evening gown, and Nathalie Emmanuel as the hacker that shows that you can be beautiful and into technology. Furious 7 is over 2 hours long, but it doesn't feel that way because it is just non-stop action. The stunts are insane and over the top excitement. In one scene Paul Walker's character barely survives getting out of a bus dangling off a cliff and the whole theater cheered! These are big intense moments, and the movie is full of them. Now, I know someone out there is bound to comment on how unrealistic the action scenes are, and how there is no way someone could drop a car out of an airplane and survive. I get it. It couldn't happen. Who cares?! It's not meant to be real, it's meant to give you entertainment, and that's exactly what it does. Like I said earlier, I really felt an emotional attachment to this movie. Knowing that Paul Walker is no longer here, made every scene with him a little harder. In one scene his character is saying his goodbyes in case he doesn't make it back. It is an emotional scene anyway, but it is that much harder knowing that the actor saying those lines is not here. I had tears in my eyes as did most of the women in the theater. Even without this added tragedy, it is really just a well written movie that shows how family is not always bonded by blood, and these family ties mean everything. I can't review this movie without mentioning what a great soundtrack it is. The music really ties it all together with some great hip hop beats that are perfect for driving, dancing, or dancing in the passenger seat, because that's how I roll. 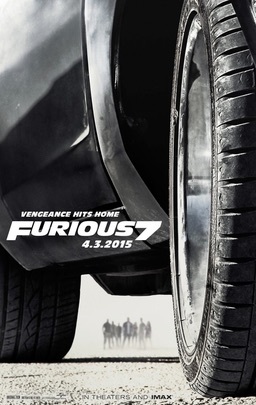 Furious 7 opens in theater April 3. Go see it. Enjoy the ride, but you might want to bring some tissues if you're a crier like me, because the movie ends with a memorial for Paul Walker and it's very well done. Disclosure: I attended a free press screening of this movie in order to write the review. I was not compensated. This site uses affiliate links. All opinions expressed are my own.